Andrew Finnie: Artist and Illustrator: The Joy of Tongues. Question: so what kind of person starts a post about the Illustration Friday prompt “Spooky”, with a title that says “The Joy of Tongues.” ? Did you know that fresh basil propped up in a glass of water in the fridge lasts longer than basil in a plastic bag in the crisper? Did you know that the seeds of an apple contain more vitamin goodness than the rest of an apple itself? Did you know that on the 2oth of this month my blog will be a year old? And finally, did you know that Giraffes (Giraffa camelopardalis) have such long necks that they, need not only amazing powerful hearts, but a complicated system of neck blood vessel valves to stop blood rushing to their brains when they put their heads down to chew grass -otherwise their corpus christi cerebellum superbum would explode like a small overripe pink carbuncle ? There you have four seemingly random facts disguised as questions. But how do they relate to each other? Or not relate? Well, the most obvious thing that sets apart basil, blogs, and apple seeds from Giraffes is that Giraffes have a very long neck. But did you ever stop to wonder what, apart from those intricate blood vessel valves, is actually in that neck? Interestingly they have the same number of vertebrae (seven) in their necks as we do (assuming ‘we’ are human). But one really big difference between Giraffe’s and ourselves is that they have an extra-ord-ordinarily long (blue) tongue. Where a human tongue averages out at 4 inches, the average Giraffe tongue is approximately 20 inches long! How handy is that eh? And oh what party tricks you could play. (see footnote ). Not to mention the fun you could have in elevators when standing behind some obnoxiously aftershaved Generation X upstart with a bare neck. Admittedly that might not be your idea of the Joy of Tongues. But you’ll have to forgive me. As soon as I saw the Illustration Friday prompt “Spooky'” I knew straight away that I wanted to write about tongues - and specifically, what joy they produce. But why? Well recently I’ve noticed that my art looks weird and creepy, dark and spooky - as if it is the product of a dark and disturbed mind (moi?) and so I have been taking notes from some of the blogs that make me laugh. I go to these blogs with a tightly closed mouth and leave with strange hee-hawing sounds coming out of my oesophagous. Quite frequently the characters in these illustrations are innocent kids with big eyes or anthropomorphised animals doing kid like things. For me big eyes are the go, as well as freckles – and more recently, tongues. Tongues? So what’s funny about tongues? Well it's not the tongues really, but they way they sit. Tongues stuck out of mouths in all directions are funny because their owners are, at that moment, completely oblivious to everything except the joy of the world. The owners of wayward tongues are almost always children. Only children can be lost in that space where they are so absorbed by the world around them, or at the task at hand. Well before I go any further I’d like to list the people who give me the joy of ‘funness’ when I visit their blogs. The people that consistently give me a silly grin, that are the cause of the extra smile lines encroaching on my ex-babyface. Well there’s Jack, and Shirley, and Bella, and Cally Jane, and Krista, and Roberta, and Vanessa. I’d recommend a visit to all their blogs – and of course if you do happen to go, you’ll discover what a bunch of sweeping and untrue statements I have made about their work. All of these blogs have a sense of ‘funness’ because these artists are all individuals, attacking their subjects in their own unique manner. Okay, well that’s probably enough blah blah blah for this week. I was going to tell you about the amazing emotive correlative Jungian archetype-like cultural iconography to be found at Don Roberto’s and Amalia’s sites. Worlds apart yet tapping into the same recesses of the human historical subconsciousness. I was going to tell you, but I won’t. Do you know Jungian Archetypes? Think Star wars , Lord of the Rings, Mills and Boon (romance novels). Typical Jungian archetypes are found scattered amongst their plots. Apart from the Unwilling Hero, there’s Old-Man-Wise- Wizard (Gandalf, Ob1 Kenobi etc), Mother, Oldlady Wise Wizardess, Evil Witch, Good Witch, Father, Best Faithful Friend (Sam in LOR), Travelling companions who give wonderful gifts (physical and mental Gimli, Legolas), Mentor (Aragon), Trickster (Sarumon, Loki), Big Evil One (Devil, Sauron), Big evil one’s friends etc -well you get the idea . But in Amalia’s and Roberto’s work we find the archetypal icons of tigers and oceans and suns and moons and icons of travel and mountains and homes. All Icons that serve dual purposes – not only do they serve the outside of the image compositionally, but they also give the image depth and meaning below the surface. The image becomes like a good poem – to be read on several different levels. And the more the audience puts into observing the work, the more they take away. In a similar vein (in that it come’s from the cultural heart) we have the Ces’s work (but I spoke about her last post and I don’t want to give her a big head), not to mention the amazingly talented witch from Tír na nÓg – who flies in and out like thysania agrippina. Yet there’s others – the puppet mistress of Bulgaria, the dark haired Norwegian Janne ocean orientated but ceaslessly experimenting and inspirational, Chopoli who makes fairies real, Martine the French woman held captive by a talking Toucan name Leo, Denise Scaramai’s digital illusions from Brazil, Laura Deschia’s expressionist tour de force paintings from Austria. And I mustn’t forget AOC who’s poetry acts on illustrations in the same way as a medium in a séance acts as a lubricator to the spiritual world. Well of course I could go on and on. In fact I would like to and I think I'll add Vanilla (who likes to tell stories), Linda (who always touches me with her tales), Ana (who has a classic Nosferatu at the moment) , and of course my good friend Karen who battles her lack of spare time with a wacom in one hand and her latest masterpiece in the other. I’ve seen so much transpotating work since I started blogging – most of it from talented females (why is that?). Enough to start tongues wagging. So that takes me full circle, to the real reason I made this post. Below this paragraph I’ve included a few versions of the finished work. If you look closely you will see three little witches in addition to the Storyteller. You will probably find Hansel and Gretel in different variations. Then there is Tim, Jack and Jill, there is the little girl who shot her teddy bear, and the old dwarf (made young again) who lived in the forest and ate other people’s gold fish. Oh I almost forgot. That’s me behind the witch. Recently I’ve been reading a book called “Enchanted Hunters” by Maria Tatar a Havard Professor Of German Languages. It’s basically a book about why children read (she has also written The Annotated Classic Fairy Tales and Annotated Grim Brothers). In the book Ms Tatar points out the magic of the written word. How words are really just black scrawls of ink on a a page, yet a sentence as simple as “The man entered in the room” can transport us to another place and another time. Words surely are magic, and yet how much more magic are they when spoken aloud (in ‘tongue’ – hence the “Joy of Tongues” title of the post). And even better in a darkened medieval room with an audience of children collected around a fireplace, an audience that readily suspends its disbelief, an audience that clings together not just for warmth, but because of the primeval instinct that tells them that there is safety in numbers. We are all children at heart. We liked to be scared, we like to be transported to distant places, to have indescribably exciting adventures – as long as we awake unharmed and safe in our own snug beds. And so enter the story teller, the old crone, the bard, the poet, the witch with the Book of Tomes, the weaver of tall tales, the keeper of the lore. 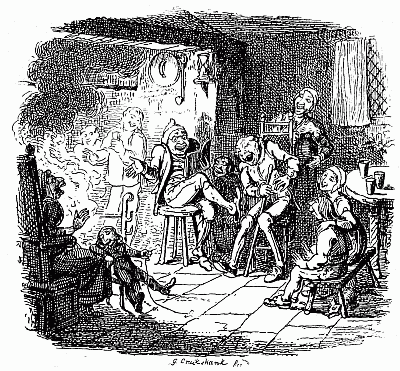 This illustration is a nod to some of those by George Cruikshank – especially the Droll Story (which you will find in this Survey Of Children’s Illustrators). And owes its genesis to the frontispiece of Charles Perrault’s “Contes de ma mere l’Oye” – the original collection of Mother Goose Tales. The rest of the illustrations are odds and ends from the rest of the week. Thankyou so much for reading. I’m going to have a small break from blogging. I need to go surfing for a while and there are some paintings yelling out to be done. I also need to stop having so much fun. I’ll come and visit your blogs though – of course (oh oh a smiley appeared). Oh and don’t forget to visit Ces and Bella’s BBB club. en un par de días termiaré. Probablemente nadie quiere ser el primero en comentar. Esto es como un salto bonji. Hola Roberto, oh es bla, bla, estoy practicando para que suene inteligente:), yo os visitaré a la mañana siguiente! ¿Has visto las banderas pequeña traducción? Usted puede leer este mensaje en Mesopotamium! Gracias por la información º en su pintura. Grandes saludos! Hay I like that fly! You are absolutely right. Tongues are spooky. Especially in ears. Yu-æærk! And right now I can´t feel neither my tongue nor my lips nor half my chin, after an appointment with a good friend who happens to be a dentist. After the sedative goes away and I am symmetrical again, I think I should be about 25% prettier. My smile at least. But that has more to do with teeth than tongue. If I ever go bald, I´ll be wanting horns. No doubt! I´ll be looking forward to looking at all the yum-blogs you´ve shared. Enjoy the surf, say hello to the whales! Hi Andrew, J'aime les girafes et leur long cou... J'aurais aimé continuer à croire qu'elles avaient ce long cou pour avoir tous ses enfants pendus pour de gros bisous!!! Je suis un peu fruitcake! En ce qui concerne les langues. J'avais remarqué en donnant des cours aux enfants au conservatoire, qu'ils sortaient presque tous leur langue lorsqu'ils étaient très captivés et se donnaient à fond dans leur créativité. I just paint things absurd, that could possibly serve for something else. Ooooh so much to read and I am being paged but first I must say what a delight to see your beautiful smile. I shall definitely return! And your work? Well, you see that girl in the 8th image? The one who has her mouth opened wide enough for flies to drop in for tea? I think I look like that now, because my jaws are starting to hurt. Lastly...(to wrap up my blabbering), I have to thank you for saying all those nice things about my work. You showed a lot of love in this post and it seems that we're all lucky to have our paths crossed here. Now, for some meat pie. Honestly, couldn't you have had it stuck somewhere else? Eh. This neck is rugby player! and he has such a powerful neck. Eh ... the boy at the center, in the first illustration, is Anthony Kiedis, as a child? Gaaaahhhhh! It took me the entire day to come back here and waht a delight. First of all you mask your great ability of story telling with irreverence but it can't be stopped. The wonderful writer emerges somehow. Mr. Finnie, you are a terrific example of the saying, more is best. Look at all these images. First of all, if I am not mistaken, I notice the young witch among the crowd, this time she is not so well dressed but just the same, it's her in disguise! Then what do you do? Oh but first some facts disguised as questions. How fortuitous. I am in serach of a giraffe, not for it's tongue alone but a giraffe for someone told me to give them a gift of a drawing, yes, I was told, not even asked and gobsmacked with the gall and ball hurled before me, I did not know how to say "no". Don't you just hate that when someone makes you feel you are doing yourself a favor by gifting them with the fruits of your labor? I mean why not just say "May I please have one of your drawings?" rather than tell "Ces, I want you to do me a favor..."
Anyhow, you are a wonderful friend saying all these great things about others, when you could just rest on your creations. And NO, I am not going to get a big head just because you talked about me previously but I thank you very much for including me in this group of illustrious illustrators. Well, I never knew tongues could be so interesting! Sure would be strange to have a 20 inch tongue though, I wonder if there is enough room in one's mouth to keep it in there? Your illustrations of the theme spooky are so enchanting, I especially like the one with the windmill. Is that someone riding a unicorn I see off to the right there? Oh hey, I own 'Annotated Grim Brothers', one of the most lovely books I own too, maybe I should also read 'Enchanted Hunters', it certainly does sound like something I would enjoy. P.S. thank you for mentioning me, I certainly do like to tell stories! Hmmmm, my blog just had a birthday too, or is about to have one, I'll have to have a look now. Wow and here I was, silly and proud of my measly 59 followers and treasuring each and every one of them and you have over a 130 in a year, I think you must be doing something right! LOL, ok, I'm just kidding. What a kind, generous, and interesting post my friend. I love the information on the giraffes tongue too. Good grief, I had no idea and if I did know that it was that long, and blue, I had totally forgotten! You always teach me something new with your plethora of information. Well, we will miss you whilst you are away surfing and painting, but I hope you have tons of fun and come back refreshed and full of inspiration. Thanks for the shout out, you are the best Mr. Finnie! By the way, Cyan says to look out for the Glaucus Atlanticus (Blue Sea Slug)and the Porpita Pacifica (not sure of it's common name). He thinks they are really cool. I'm pretty sure he has made me tell you that before, but there you go. Love the new picture, and your without your disguise! good stuff. wow, one year of blogging - that's great. enjoy your surfing trip. Oh. I'm sorry Andrew, this week it is very difficult for me. I managed to understand the advice to keep fresh basil. You know here, most are descendants of Spanish, Italian, and some other French. So the Mediterranean food is what more we eat. and albahaca, is a spice widely used, especially to make pesto, you know, pasta with pesto. (Garlic, olive oil, albahaca and walnut). So thank you very much for the advice. About your artwork. All told you so. What else I can add?. Ah, have a good weekend again. Very nice writing Andrew. I enjoyed it... Don't forget your sunscreen or you'll end up looking rather spooky! Well, a very happy blog birthday to you! Mr. Finnie, well, what can I say. I am quite honored to be recognized by you and humbled to be mentioned in such esteemed company. Thank you, in all sincerity. I find your blog to be like a complicated culinary creation, something very worthy of Top Chef. It's the perfect blend of unexpected flavors. Whereas your art makes my eyes widen and my jaws hang loosely in awe, my sides start jiggling from all the merriment and laughter in your prose. What a perfect combination. No, no, I am not a pretty sight when reading your blog. That is why I do it in private. Your children here are a delightful crew. Such diversity in expressions, yet they are all so focused and attentive. They must be under a fantastic spell. Oh, and I love the pointedness of your ears. That would make you the archetypal Yoda. As a footnote, since we are talking about tongues, did you know I often find mine sticking out at all angles when I am deeply concentrated in a drawing? No, it is not blue. As a second footnote, since it's good to have two foots, did you know that apple seeds are toxic? Have fun on your break! Hang ten, dude, or whatever the jargon is nowadays. ANDREW FINNIE: ARTIST AND ILLUSTRATOR (blog) HAPPY BIRTHDAY!! I suppose that in Australia it is October 20. I'm uncorking a bottle of Merlot. So here are still at 7pm. and this time I like to drink a smooth wine! Anyway-- Thanks for the mention! Funny, you don't look like an optometrist. Interesting post, I had never thought about the giraffe's tongue before. Humans certainly would be different in many ways with a tongue like that...would that mean new flavours? I also thank you for the other links because there are some blogs I haven't visited before. That book you're reading sounds good, I like what it says about the magic of words. A good story really awakes our imagination...I'm not sure children are reading enough these days with all the visual information they receive ( Internet, television...)There are good things about it (as blogging :)) but a good book can't be replaced. Then, woww! language and words, that magical thing! I always thought that 'the word is powerful' and that every word spoken echoes through the universe forever, echoing his own energy! why, with all power of words wish long life to your blog, the arts and you! may we always share our art and learning more and more! thank honored to have been quoted in this select group, which awakens you a smile! Hey Andrew! Happy 1 year posting/blogging anniversary! I celebrated by reviewing your last year of posts. Here are some highlights. Your first art post was for IF's "blur" topic. You only used 44 words in your first 3 posts.Your second post contained three adorable dogs, which you stated at the time is not really your style. Your first cat showed up in your 4th post. The first rat, in your 6th post and first dragon in your 7th post, which incidently was also your first tongue. Thanks for a great year of posts my friend. Have a blast surfing and thanks for the shout out . You and Ces have certainly brought our art family together! Another great post this week. Spooky tongues :Oo Hey check out this you tube clip......youtube.com/watch?v=CdmuJjLr2_M ..
DEAR Andrew, HAPPY 1ST BLOGGAVERSARY!!!!!!!!!! Let your blog remains a magic place for discovering and meeting people, for taking challenges and following inspiration, for sharing art and breathing beauty in all its forms! What a post! Looooooooooooooooooong as a giraffe's tongue :) and unexpectedly serious and very kind to all of us. I feel honoured to be mentioned together with all these lovely and talented artists. Thank you!! Your drawings are amazing as usual - all the personages create the atmosphere by their facial expressions and bodies' language.And I like that!! Congartulations on your bloggaversary once again!! can i blablabla about the apples here? i dunno, i'm currently under antibiotics plus i have had sleepless nights, so..... yeah. "Did you know that the seeds of an apple contain more vitamin goodness than the rest of an apple itself? " hmmmmmmmmmmmmmmmmm ok, let's take an apple that is grown from a particular garden for an instant. it’s just like another apple but has different qualities than any apples of the same species that have been grown in distinct vicinities. speaking of qualities, the factors that determine the qualities include.........................hmmmmmmmmmmmmmmmmmmmmmmm calculable properties of the soil character itself let's say water absorption, some minerals, microorganism and those cute little living creatures "worms", and blablabla whatever (not to mention insecticides or any other plant treatments). the circumstances mold each apple into varied characteristic and what’s great about it? each apple has a slight different taste though generally it tasted like it should: an apple. no, i didnt know that the seeds of an apple contain more vitamin goodness than the rest of an apple itself. andrew, thank you very much for the compliment. Well !!!!! I am very proud!! We have an agronomist engineer friend! love really is colder than death. Apple pips more vitamins maybe but I would't eat them if I was you unless you want a nice case of cyanide poisening. will you stop deleting things??? Andrew. your comments are always very successful. I really appreciate you coming to see my simple painted designs. That probablente are only the creation of a disturbed mind. Who dares to acknowledge here that has a disturbed mind? Ehhh, I already put my left shoe, and now what should I do? four hours ago I woke up and still I have a question! I am the sign of Libra but not achieving the right balance. I heard someone say: "The alcohol induced amnesia, and something else I do not remember"
Well, Andrew. Does it feel to have another year?. I can not say because when I got to 50 I started the countdown. (every year I delete two) and I am younger than my children, not that amazing? I have a basil from several days ago and still like new! Almost a day without someone to leave a comment! I have a new follower. Is not it a wonder that anyone would want to be a follower of a blog as silly as mine? Aquí tampoco, yo dormiré la siesta!. Aren't inspiring, educational, funny and spooky blogs fabulous?! I love it that you share links that are groovy. I LOVE giraffes! Thank you for the fun facts, and that one thing about the blood in the necks I had heard and forgotten! Isn't that amazing? I love those long tongues. I wish I could feed a giraffe right now! Well. THAT was certainly a post worth reading. In a way, it reminded me of Toni Morrison's laureate (spelling?) speech. So much to think about. I must admit that I have NEVER thought about tongues when making pictures. Faces, yes, hands, definitely, feet, often, and arms, legs, torsos, all of which I find wonderfully expressive, but tongues....nope. They're usually hidden inside mouths. But the other meaning of "joy of tongues", the speaking, the story-telling, yes. Yes indeed. That's just about the most basic of human urges. I loved reading this post, loved the images, which are not so creepy at all (though yes, I would agree that many of your images are), but warm and full of life. You are endlessly entertaining :) This is a fun post, and it's fun to check out everyone else's blogs too. Thanks for the mention! I'm sure we'll all miss you while you're surfing, but I hope you have a lot of fun doing it!! I have noticed that nobody wants to be the first to leave comments. but neither wants to be the last. I call this "fear of going to older post"
But, my psychologist told me that this fear I've overcome. so here I am writing. I have no fear if I'm the last!!!!!!!! !Older post here I go! Eh eh! I want to be the last! MR. ANDREW! How have you been? You've posted a lot of goodies in this post....actually your entire blog is awesome! Happy 1st Blogoversary! May there be many many more!!! I'm at my desk surrounded by papers, I must put exactly two million three hundred twenty-five thousand and forty-two seals. when only remains for me to put two, I'll be back. Thank you, Andrew. Continue your great vacation!I promise, I will tell you before I delete my blog. This "bloggit", your paintings in it, your ideas -- all make for a wonderful experience browsing around your website. You have done so many paintings and are using (I guess) digital media (for enhancements?). Could your perhaps reveal to the lesser talented some of the steps used in your artistic technique to end up with such amazing paintings/pictures?